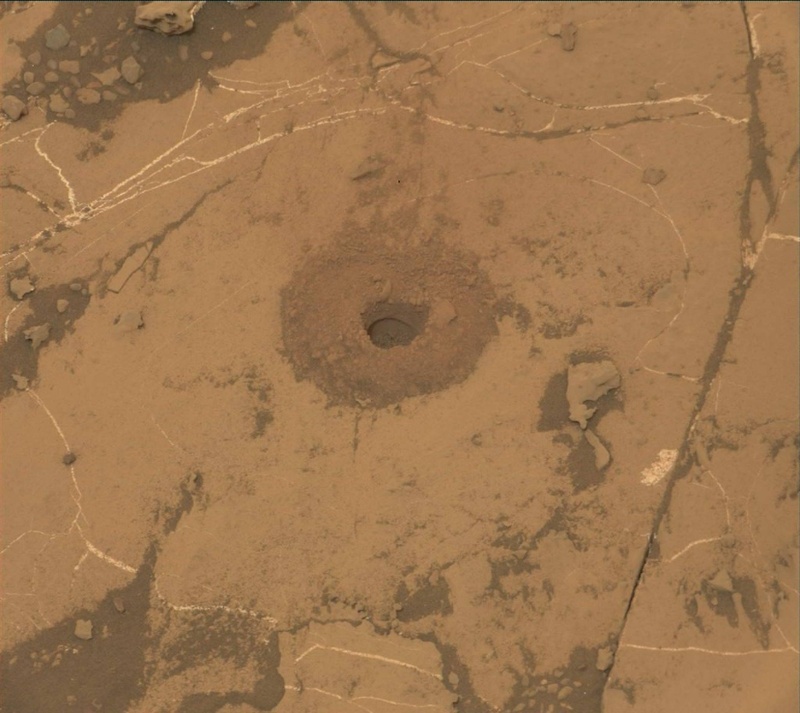 In today's plan, Curiosity begins analysis of the long-awaited Pettegrove Point drill sample at the "Stoer" target, which was successfully collected last week (and I had the pleasure of helping to sequence as a Rover Planner). Our main activity is the drop-off of sample to CheMin, based on the characterization of the drop-off portion size done in the weekend plan. There is still a good bit of wind, so the drop-off is around noon, during the calmest time. Overnight, CheMin will be busy analyzing the sample; we'll have the results down late Wednesday, which can then inform decisions about dropping off sample to SAM as early as this weekend's plan for analysis early next week. On both sols of the plan, we're continuing our atmospheric observations to monitor the dust storm as it continues to abate, with dust devil surveys, and zenith and horizon opacity imaging. We'll be collecting additional ChemCam and Mastcam images of the drill hole, to look for vertical variability, and of the tailings, for change detection. ChemCam is also focused on mapping the bedrock variability by looking at several targets at various distances from the drill hole: "Pitlochry," "Ben Lui," and "Caltron Hill." Mastcam will be taking supporting documentation and additional change detection images on targets "Belhelvie," "Camas Mor," and "Sandray".